If you are looking for some of the prettiest and most diverse group of bulbs available for sale, then Fritillaria could be the species to look for. 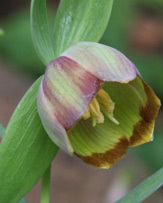 Fritillaria, a popular flowering bulb with over 100 species you can buy many online in the UK . Bulbs are available fro sale online, look for firm bulbs of a flowering size. With Fritillaria, look for specialist growers for the best quality and most reliable bulbs. 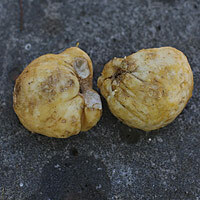 Growing most fritilaria bulbs is not difficult however some species, such as Fritillaria Imperialis can be a challenge. he small delicate flowers of Fritillaria liliacae and Fritillaria sibthorpiana are delights in early spring. Many species are readily found for sale and for the enthusiast seeds of rare and unusual frits are available to buy online. Fritillaria are one of our favourite bulbs, with over 100 species and a wide range of forms and size from smaller flowering Fritillaria meleagris, Fritillaria liliacea and Fritillaria sibthorpiana to the large flowering Fritillaria Imperialis and Fritillaria Eduardii. Large Fritillaria Bulbs such as Fritillaria Imperialis (lower right) and Fritillaria Eduardii need to be planted 20 - 30 cm deep in a well drained soil. 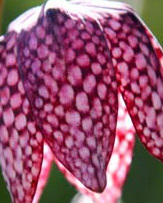 Smaller bulbs such as Fritillaria Meleagris can be planted 10 - 15 cm deep. Fritillaria imperialis is perhaps the trickiest to grow, the bulb has a hollow centre and has a tendency to rot. Try keeping Fritillaria imperialis bulbs dry during dormancy, plant the bulb on its side, or try a well drained large pot with thick sides that prevent the pot from getting to hot (plastic pots tend to over heat easily) keep the pot under cover during the winter and place in the garden at the first sign of growth. Do not use water saving granuals in potting mix with Fritillaria. Try a liquid fertilizer when new growth commences in spring. Fritilliaria Bulbs are available for sale from the following participating nurseries. Fritillaria bulbs, for us, are one of the most enchanting you can grow, the snakes head fritillaria, or fritillaria meleagris is probably the easiest to grow, and it is fascinating with its checkered or pure white drooping flower head in spring it will make a show. If you are patient try fritillaria imperialis this is the crown prince of fritillaria up to 1.5m with orange or yellow 'Maxima Lutea' drooping bell shaped flowers from the top of its tall stem. Plant Imperialis on its side deep in the soil (up to 500cm) and maybe if you are patient you will have a clump of spectacular fritillaria in a few years. In Latin ' fritillus' means checkered dice box. 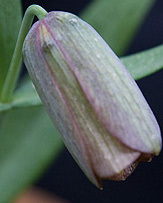 Propagate fritillaria from offsets, or seed. 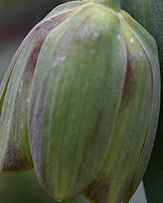 Fritillaria Bulbs can be divided into 3 groups, Asian Fritillaria, European fritillaria and North American Fritillaria. EUROPEAN FRITILLARIA F. conica, F. davisii, F. ehrhartii, F. euboica, F. gussichiae, F. meleagris, F. messanensis, F. obliqua, F. pyrenaica, F. rhodocanakis, F. rixii, F. tubiformis, F. tuntasia. NORTH AMERICAN FRITILLARIA F. affinis, F. agrestis, F. biflora, F. eastwoodiae, F. falcata, F. liliacea ,F. ojaiensis, F. pluriflora, F. pudica, F. purdyi, F. recurva, F. roderickii, F. striata, F. viridea.